There will be a “brief pause” in bus service from 10:30am – 12:30pm on Tuesday [Dec 4] to accommodate a general staff meeting which “will serve to further advance the completion of the new public bus schedule,” the Department of Public Transportation said today. A Government spokesperson said, “The Department of Public Transportation [DPT] is advising of a brief pause in bus service on Tuesday, 4 December from 10:30am – 12:30pm to accommodate a general staff meeting. 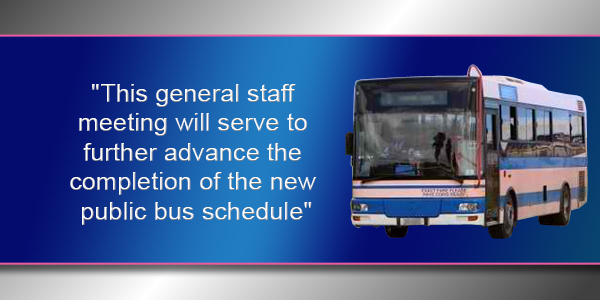 “This general staff meeting will serve to further advance the completion of the new public bus schedule. How hard can it be to keep busses on the road of a country of 60k people with land mass of 21 square miles. Ya’ll should be ashamed of your incompetence!! This general staff meeting will serve to further advance the completion of the new public bus schedule..
All the experts outside looking in thinking they have it all figured out… Continue, this is entertaining. Bermuda needs to move on with this ongoing transportation nonsense and PRIVATIZE OUR TRANSPORTATION and run it like a business. Its almost like their doing us a favor by sometimes providing bus services. Lets get real Bermuda and lets stop this crap. Any other organisation such as a club, political party, religious, hobby, sport etc. which do NOT pay their members a salary have their meetings outside of business hours. The BIU does not pay its members. Have your meetings when everyone else does. Have them in the evening after business/high demand hours. Who runs the bus service, word used very loosely, anyway? Imagine the dishwashers or waiters setting the menu in a restaurant. What time would you advise that they have their two hour meeting? Peak bus hours are around 7:00- 9:30 in the morning and then 3:00-7:00 at night. Would you want them to have their meeting at 8:00 to 10:00 and have them forget about the fact that they still have homes to go to?